Lucky's favorite song is "What does the Fox Say?" When he was a newborn, I sang this to him at LEAST once a day. (Less now that he is running around, but I still try to get a few bars out.) 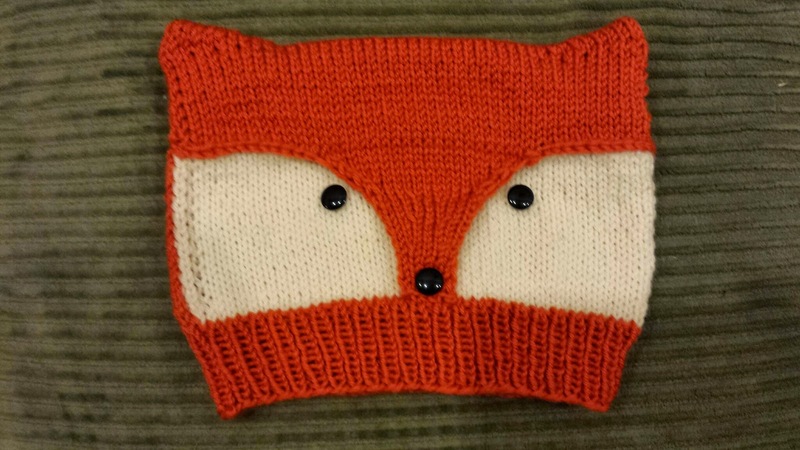 The Pattern Foxy and Wolfie pattern is stunning, and as soon as I saw it I knew that I wanted to make one for Lucky. The pattern contains really nice instructions for the special techniques (intarisa in the round, picking up wrapped stitches) and even has a photo tutorial. Orange may not be my favorite color, but I wanted to make a foxy hat for my foxy baby boy. I picked up some cascade 220 superwash in colors 817 (off white) and 822 (orange) while I was on Mackinac Island visiting my parents. There was a markup for the choice, but I was happy to pick the exact shade of orange I wanted without having to guess with online pictures. I want this hat to be perfect! I swatched on size 5 needles first because I had them with me on the couch already after finishing up Lucky's Owl vest. The gauge is a little tight. 5 sts/inch rather than the 4.5 sts/inch the pattern calls for. With this yarn, I don't really want the gauge to be any looser. 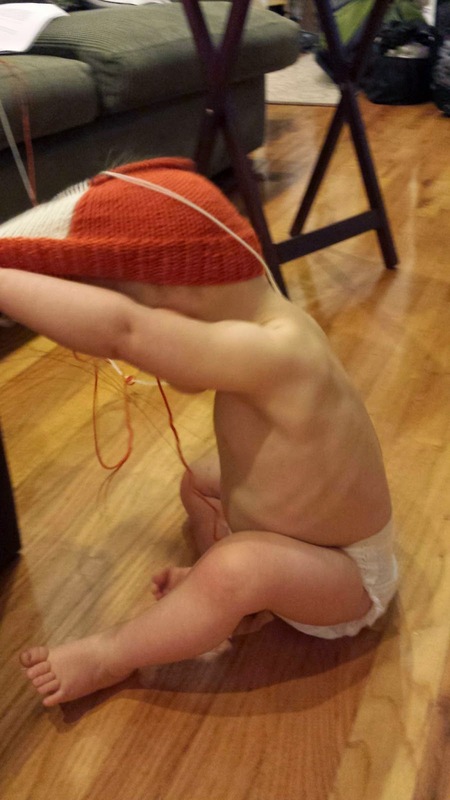 If I knit the second hat size (Technically 3-5 year) then it should be 18.4 inches around which would fit lucky. I cast on 92 sts (3-5 year size) and knit 11 rounds of ribbing to hit 1.5" long. I completed all 24 rounds of the intarsia as written. I think the length will be good for Lucky with plenty of room for him to grow into it. The hat measured about 4.75" at this point. Ear Shaping. When picking up the stitches I got the right number by picking up every other stitch. Hopefully this will look okay. 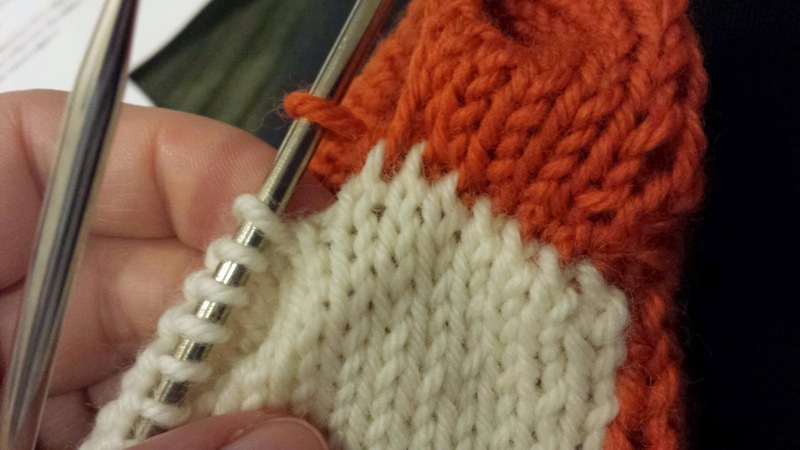 I completed incorporating the picked up stitches on row #33, a RS row. I then purled one WS row. 34 rows total. The link for shadow wraps didn't exist anymore, so I used the following video. When binding off stitches, I picked up a few stitches in the corner for the first stitch I would bind off so there wouldn't be a hole at the base of the ear. I did the same thing with the last stitch. 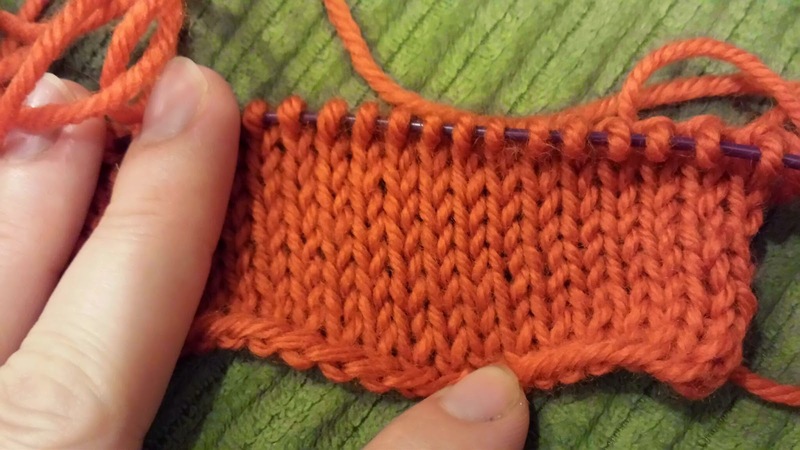 With the first few stitches of the 3 needle bind off, I began to feel like I was doing something wrong. 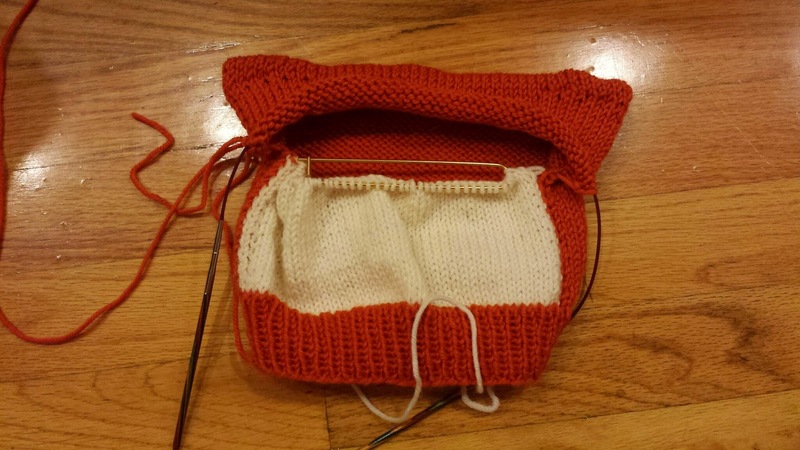 OH, with Knit sides FACING each other. This is the same mistake I made with Lucky's vest! Well Hmm... 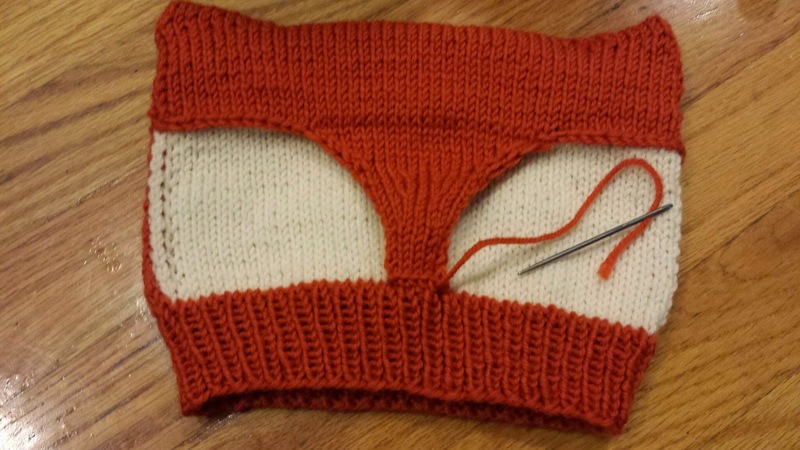 In order to do the nose shaping as written I will need to break the yarn and rejoin on the next side. It seems like that last WS row that I purled may not have been necessary. We will see if this turns out any better. 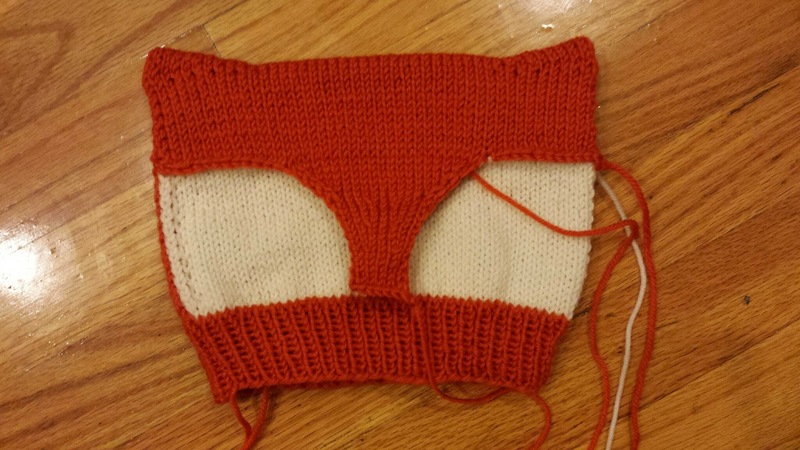 So it turns out that by looking at the picture closely on Ravelry, I had it right the first time. I'm undoing and rejoining at the beginning. Sigh. USE THE WS FACING! 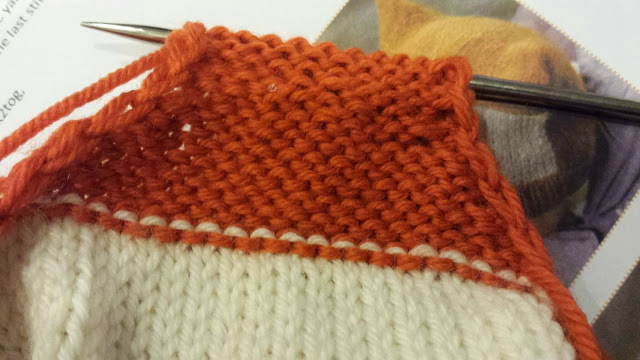 to try to hid the purl bump I showed above I knit the MC stitch at the same time as purling the WS stitch. 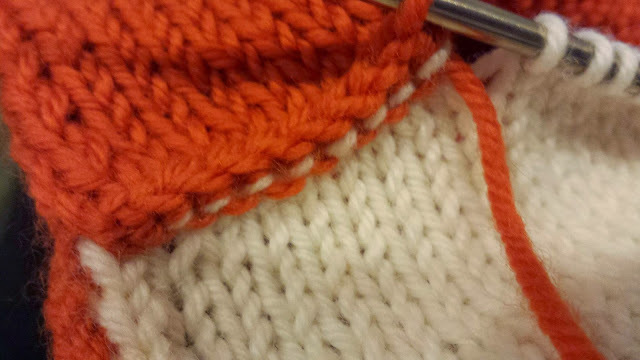 (sort of how you insert needles during the kitchener stitch.) I held the yarn between the two needles to accomplish this. Unlike when I was pregnant, I can now check my progress directly on Lucky's head (10.5 months). He only pulled out 3 sts as I tried to take this photo. Nose Shaping - I didn't know what the chain stitch edge was. Turns out the instructions are perfect and it is looking great. No curled edges here. 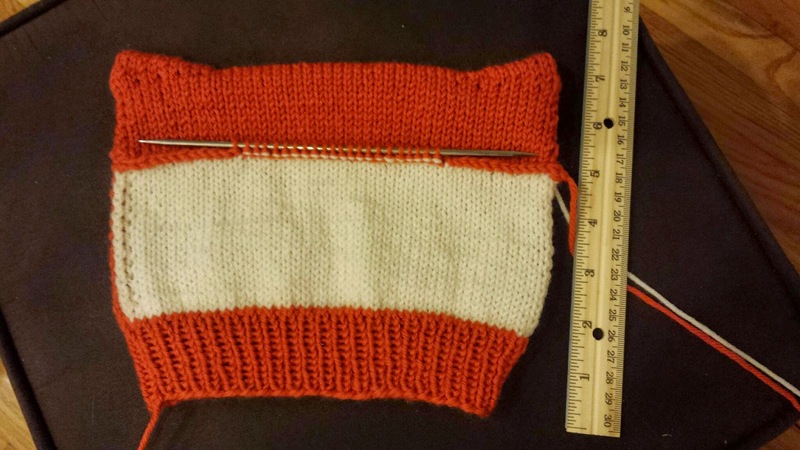 I added two more rows to the length of the nose, making it 21 rows knit before the bind off. 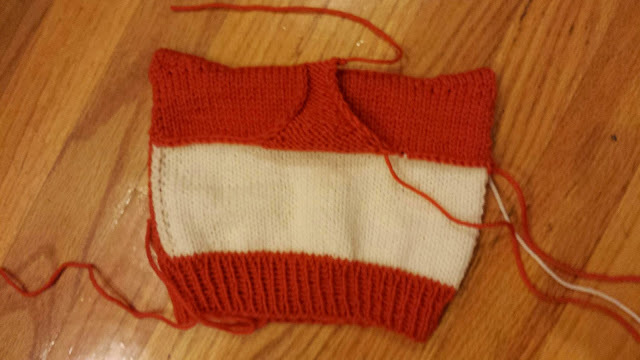 I secured the bottom of the nose to the top of the ribbing. I got the Fashion Button 1/2'' Denver Black from Fabric.com. 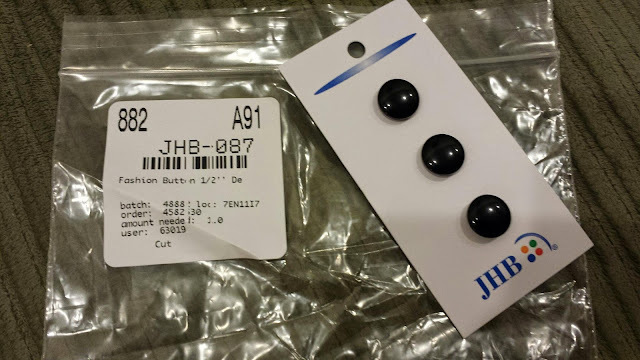 I purchased another set of 3/8" buttons but those were much more spherical than flat. I think that these flat round buttons will be PERFECT for my little fox. Maybe next time I would order some that are slightly bigger. 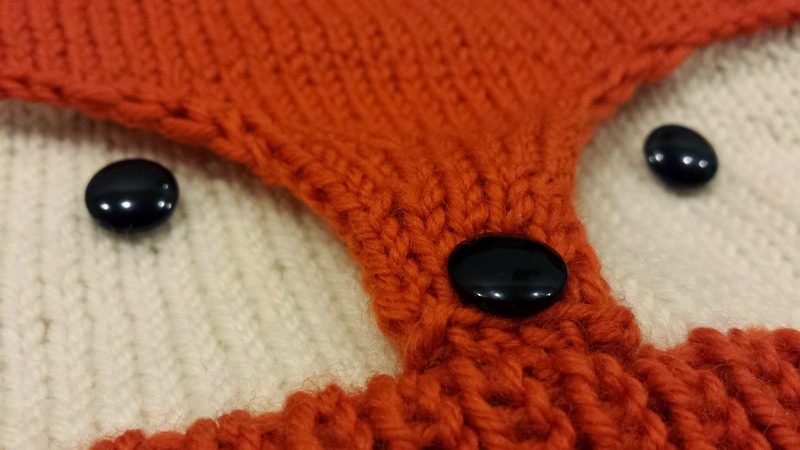 The button on the nose was easy to place because it was secured through two pieces of fabric. I hat a harder time getting the eyes in the right place but I think it turned out okay in the end. We still have to get Lucky other winter gear. You know, a coat, snow suit etc. I hope to make a matching pair of mittens, I have plenty of yarn left over. When we are outside, Lucky is good about keeping this hat on, but he rips it off as soon as we are inside. As I'm finishing up this post in October, Lucky has already worn the hat numerous times. 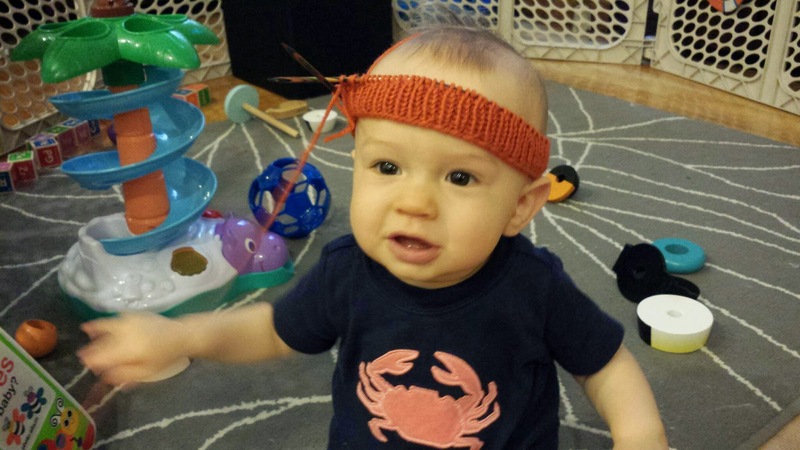 People comment on the hat all the time and seem impressed when I tell them that I made it. I really love projects that make people smile! That might have been where he pulled out some stitches. 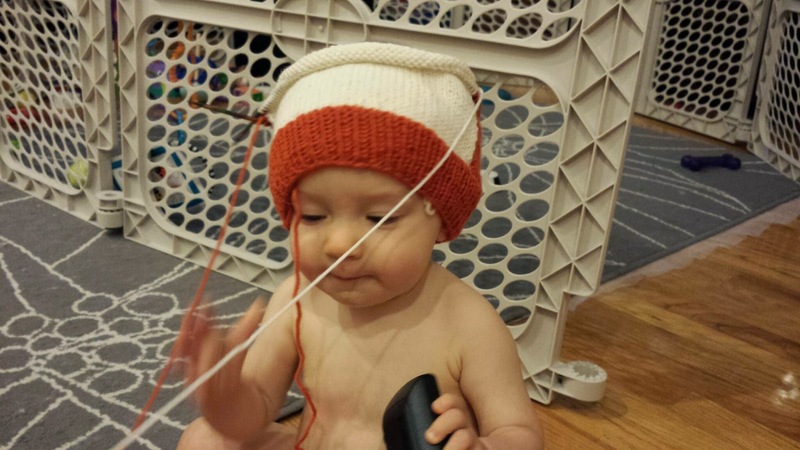 ;) I think this is of of my favorite hats I've ever knit.